Green Inlet Marine Park offers a sheltered all-weather anchorage set in a scenic fiord. 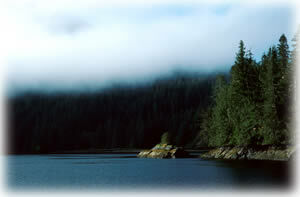 The park encompasses the sheltered all-weather anchorage of Horsefly Cove and surrounding water. Nearby, but outside the park, is the tidal lagoon of Green Inlet with the reversing rapids at Baffle Point (unnavigable). There are no facilities provided at this marine park. Park Size: 18 hectares of marine area and 19 hectares of land area. Lots of chain or rope is required for safe anchorage. Bring your own drinking water as potable waer is not available in the park. Green Inlet Marine Park is on the east side of Tolmie Channel across from Princess Royal Island, just west of Fiordland Recreation Area. 196 km south of Prince Rupert. It is accessible by boat only. Refer to Canadian Hydrographic Chart 3738. Supplies are available at Klemtu or Bella Bella. History - The park was designated in 1992. Wildlife - As you cruise through the area near the park, watch for orcas, Pacific white sided dolphins, seals and other marine mammals. Sea kayaking is possible, although access to the park is lengthy and requires experience - it would be better to use a motorboat to get to the inlet and use the kayak or canoe to explore the inlet. Fishing for salmon and rockfish is possible here. Anyone fishing or angling in British Columbia must have an appropriate licence. Swimming is permitted BUT not recommended since the water is very cold. There are no lifeguards on duty at provincial parks.